Which new institutions do we need in order to trigger local- and global sustainable urban development? Are cities the right starting points for implementing sustainability policies? If so, what are the implications for city management? This book reflects the situation of cities in the context of global change and increasing demands for sustainable development. 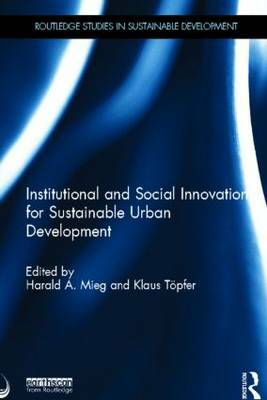 The book introduces core findings, new methods, and international experience related to sustainability innovations and the social transformation of cities, synthesizing insights from megacity research, sustainability science, and urban planning. Written by a team of more than fifty leading researchers and practitioners from all five continents, it traces general urban transformations and introduces new approaches such as: smart growth strategies; cross-sectoral, transdisciplinary urban transition management; rubanisation; and city syntegration. The book reveals the potential of new, networked agencies of sustainability transformation, and discusses the role of science institutions in the diffusion and implementation of institutional and social innovations. This comprehensive book is of immense value to students, researchers, and professionals working on issues of sustainable development, in environmental programs in human geography, planning and the built environment, sociology and policy studies, institutional economics, and environmental politics.